After yesterday's post, I'm adding (see below) a few more potential climate change memes — ideas or phrases that I'm trying to get into common parlance, like "household names." (Remember Spiro Agnew? Okay, forget it.). 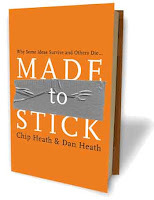 And that's got me thinking of Chip and Dan Heath and their study (that hasn't quite become a meme yet) of STICKY messages (Made to Stick: Why Some Ideas Survive and Others Die). The idea of "sticky" messages comes from Malcolm Gladwell's The Tipping Point (how's that for a climate change meme? 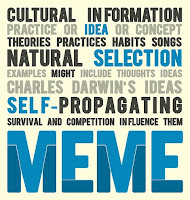 ), which talked about how ideas and behaviours catch on in society. The Heath brothers took it further and researched what actually makes messages stick. A Time article explains that "Together they find that the key to creating traction is to take your idea, whatever it may be, and present it as a Simple, Unexpected, Concrete, Credible, Emotional Story. 'We were a little embarrassed when it turned out that we could summarize it with SUCCESS,' quips Chip." So, I'll let you decide if any of these potential climate change memes are "sticky"! Progenycide. You're either for it or against it. We are unwitting accomplices in crimes against all future generations being committed today by world leaders and CEOs of big corporations who think the economy is more important than life itself. My favourite from green design guru, Bill McDonough: How do we love all of the children, of all species, for all time? Stop the killing. Stop the burning. Zero carbon means zero meat and methane, and zero fossil fuels. Why are climate change skeptics and deniers against making the world a better place for their children and grandchildren? Transforming our fossil-fuelled economy to a renewable-energy economy will make the world safer, cleaner, healthier, more equitable and more peaceful. "Make love, not war" takes on a whole new meaning when faced with climate catastrophe. Get our soldiers home and retrofitting our cities. Zero carbon means no more wars. We need a Global Green Fund. Every country chips in 10% of their military budget. No skeptic/denier is against a better future for anybody. They simply don't want to achieve it through Cap&Trade. That's it, just get rid of Cap&Trade. No one will stand in the way of investments in renewable enrgy, there will be no restrictions. Just dump Cap&Trade, that's all we ask. 1. That you [the royal "you"] actually DON'T care about the future, because your actions (as opposed to your words) show disregard for what is already happening to hundreds of thousands, if not millions, of children in climate-ravaged parts of the world. 2. That if it weren't Cap & Trade, the barrier would be whatever other solution had been put forward. For example, would you be happy with a $300 per ton carbon tax (the approximate amount that Sir Nichols Stern recommended)? Lower income taxes, higher pollution taxes. Not a bad thing, right? What is the future worth to you? What are you willing to give/accept to safeguard the future for y/our grandchildren? Cap & Trade is the current American solution (and you're right, it's not a solution that's going to make anyone happy, from what I've read about it, except the fossil fuel dudes). There is, however, more to the world than America. If you don't like what's happening there, look to see what solutions other nations are coming up with and fight for their implementation in the U.S. I have to keep reminding myself: compassion, compassion, compassion. Compassion, by its definition, is not about oneself. Try to keep the children at the centre of all decisions and choices, and perhaps we'll be able to get ourselves onto a compassionate path to that better future. Thanks for writing. I appreciate you taking the time. The idea that cap and trade is the only thing motivating the deniers is as laughable as the non-science the deniers spout all over the Internet. As for a meme, how about: Why do environmentalists care more about your kids than you do?